We would skip this site next time, sites are close together and this campground concept of a pull-though is a bit off ..
as you can see this "pull-through" site is a pull-over on the side of the road. Note that our door was facing the road .. EEK! I'm not fond of this kind of set-up -- it was similar in the Tetons -- we were fortunate that our site actually had some space between us and the road, but many of the sites had you basically parked on the road and there was not much room for passing cars and trailers. The up side was that the sites themselves were a decent size. 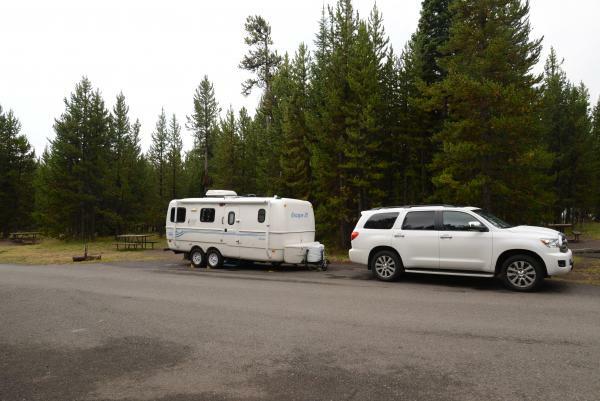 We spent one night at the Fishing Bridge RV Park in Yellowstone, mostly because of closed roads the year we were there. We found out why the Rangers call it a "parking lot with hookups" This was our view there. If my memory serves correct (rarely) Norris was our favorite campground. The Museum of the National Park Ranger is nearby and very interesting. When we were there, the volunteer staffer had been a ranger for decades and had great stories to share.